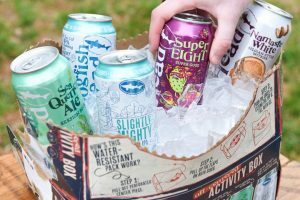 (Milton, Del., April 5, 2019) – As the warm weather rolls in, Dogfish Head raises a can to toast the upcoming season’s SWEAT-sational activities with its Off-Centered Activity Box. A summer-centric variety 12pk of cans perfect for beer drinkers with active lifestyles and conscience consumption mindsets, the Off-Centered Activity Box includes a selection of four sessionable sippers, including two fan-favorites – SeaQuench Ale and Namaste White – and two new off-centered ales – SuperEIGHT and Slightly Mighty. The Off-Centered Activity Box also doubles as a functional cooler (just pop it open and add ice), making it easy to transport to any summertime occasion. Dogfish Head has proudly been focused on brewing beers with culinary ingredients outside the Reinheitsgebot since the day it opened as the smallest American craft brewery 24 years ago. Dogfish Head has grown into a top-20 craft brewery and has won numerous awards throughout the years including Wine Enthusiast’s 2015 Brewery of the Year and the James Beard Foundation Award for 2017 Outstanding Wine, Spirits, or Beer Professional. It is a 250+ coworker company based in Delaware with Dogfish Head Brewings & Eats, an off-centered brewpub and distillery, Chesapeake & Maine, a geographically enamored seafood restaurant, Dogfish Inn, a beer-themed inn on the harbor and Dogfish Head Craft Brewery, a production brewery and distillery featuring, The Tasting Room & Kitchen. Dogfish Head supports the Independent Craft Brewing Seal, the definitive icon for American craft breweries to identify themselves to be independently-owned and carries the torch of transparency, brewing innovation and the freedom of choice originally forged by brewing community pioneers. Dogfish Head currently sells beer in 44 states and Washington D.C. For more information, visit www.dogfish.com, Facebook: @dogfishheadbeer, Twitter: @dogfishbeer, and Instagram: dogfishhead.